A guide to setting up dual computer monitors. Having a video card with dual output capabilities is very nice. One great advantage it provides is the ability to have two monitors for your desktop. You can use this setup in a variety of ways. Website authors like to have a writing program open on one of the monitors and then display the web page on the other so they can see the changes they make right away. Fortunately, setting up dual monitors is very simple and this article will walk you through the procedure. Before you begin, you will need a video card that has at least two output connectors. Typically, modern day graphics card have at least two, sometimes three, output connectors. If you look at the ones recommended in our Budget Gaming Computer Build, Mid Range Build, or the High End Build, these all feature at least two output connectors. Once you have yourself a video card capable of dual output display, you will need two computer monitors. Please note that you can actually hook up an output to a television screen but this is not recommended. Television screens are generally larger than a computer monitor and having to adjust your eyes from a computer monitor to a larger TV monitor can be unpleasant. We suggest getting two monitors of similar size and display settings, for example, two 24 inch monitors with 1080p display capabilities would perform rather nicely. Next comes the actual setting up of the hardware. Some monitors allow you to orient them in portrait or landscape fashion. Portrait layout means the monitor is taller than it is wide and landscape is the opposite, wider than it is tall. It is completely a matter of personal preference. Once decided on the layout, hook up each monitor to the video card output connectors. Newer video cards use the white colored DVI connector while older monitors connect to the blue colored VGA connector. 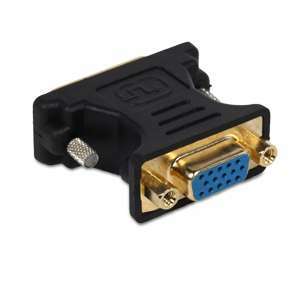 The newer DVI connector can be adapted to the older style VGA connector by the use of a DVI-VGA adapter. So if you find yourself with only the older style VGA monitor but your video card has only DVI outputs, no need to worry, just put an adapter on them! Once you have the monitors set up, its time to configure the software settings. Thankfully, the newer Windows Operating Systems (XP, Vista, and 7) make this an easy task. The software setup is very similar in each operating system. If you right click on the desktop, a menu will pop up and one of the choices presented is Display Properties (or very similar). In the ensuing screen, this is where you can configure the multiple monitor setup. For example, you can have each monitor show the same image, which is called the clone setting. This is very useful if you want to show other people how to perform an action on a computer without 10 people standing over your shoulder. Another possible monitor setup is the “extend the desktop” function. This very useful for having a larger place to work. On one screen you can be typing away with a writing program while the other is displaying a webpage that you are reading. The last task is to tell your Operating System the physical layout of your monitors. This is more important for the extend the desktop setting but is still important nevertheless. If you want your desktop extended to the right, set your left side monitor as “1” and the one on the right side labeled as “2.” This way when you drag a window to the right it will go to the right side monitor. Having a dual monitor setup is very nice, especially for those who write or do research quite often. All that is required is a video card with dual output connectors, two monitors, and a little bit of time to configure the settings then you're off and running! For a great selection on computer monitors and video cards at excellent prices, check out www.TigerDirect.com.